Cooking With Siri | Recipes, Reviews and Reflections. : Roti on an Egg and a blogging break! ...though I am plannig to keep my photo blog active with some lovely pictures of India, I will be taking a blogging break from my food blog. But before I do that, I wish to share a really simple yet tasty recipe with you all. ...Do you like the combination of omelet with a roti or a chapati? If you haven't tried yet, then you HAVE to. It is simply the best. a) Prepare some of our usual rotis or chapatis. b) Mix - eggs with salt, red chilli powder, garam masala and fresh coriander. c) Heat little oil on a pan, pour the egg mixture on medium heat. When half done, press a roti over it so that the omelet sticks to it. d) Cook for a minute more, roll it up and Serve! It is as easy as it could be. [Updated]: Check out Sandeepa's Kolkata Egg roll. Thank you Sonia. I loved this recipe :) Also,Wishing you all a very Happy and Joyous Ugaidi :). May this year bring you lots of happiness and all your dreams come true! Hope Spirng arrived at your neck of woods and you are enjoying lots of sunshine, at times a lovely drizzle of rain with birds chirping and flowers blossoming. ....and I am all set to enjoy the blooming hot days in India! Hey Siri, Good luck for everything! :) Yes, i made this egg-roti from Sandeepa's blog. I'm drooling at ur pic. Sonia - I was so curious to see Sandeepa's recipe. So I googled and updated the post with it. Thanks for your warm wishes Sonia :). All the best for your new life ahead. congrats!! Have fun and enjoy!! Enjoy Gal..Wishing you loads of happiness..
that is indeed a good idea! Have a Great vaccation siri! Ur egg chapathi roll is so good and it tempted me on first sight. this is going to be prepared for lunch today!! 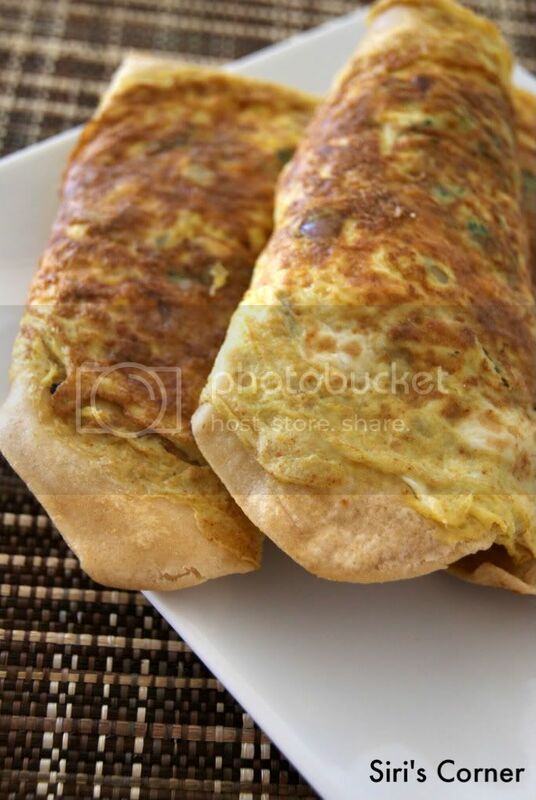 egg roti looks really tasty..god clicks..
enjoy your holidays in India..
lovely recipe. I sometime make this wth leftover rotis for breakfast but definitely your look better. all the best for your happy summer wedding dear. have a blast of a lifetime. I too make this but named it roti Omlette and wrap it with some paneer inside. Have a great timein India. I usually make the roll with the egg on the inside! looks delicious. 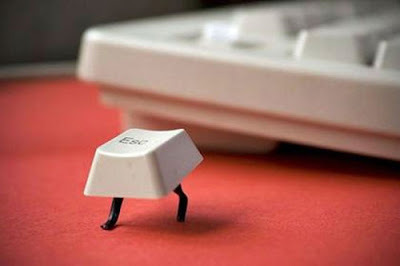 And that picture of the Escape Key made me smile! Have a great break. Have a safe and wonderful trip, Siri! Wonderful recipe. I am going to try this! And all the best for everything. Siri, Have a fun filled trip and stay safe !! I love roti with omlette! I don't generally do it the way you made it here, but just end up making a roll of roti and omlette and eat it with maggi tomato chilli sauce ..yum! !Will try it your way next time :). All the best and wish you lots of joy and happiness!! Wow! They look so tempting and sumptuous. Thanks for sharing! Have a wonderful trip.Your mom's food is waiting for you. I also cook this food but it is called omelet, I only prepare it during breakfast but there is one thing I always make sure, that is to mix it with different herbs and spices.